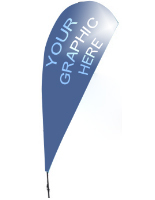 These Beach Flags Feature Custom Advertising to Help Draw in Potential Customers. This Company Sells Many Styles of Products. 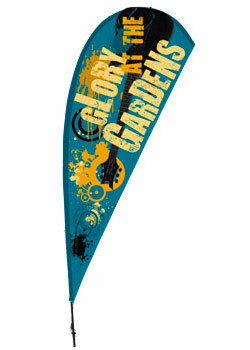 Order Outdoor Promotional Beach Flags at Great Prices Today! 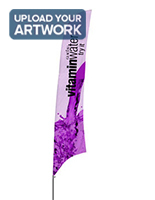 Digitally printed beach flags display intricate graphics in vivid color! Included ground spike for stabilizing graphic banner. Pole can be disassembled into 3 separate pieces for easy transport. 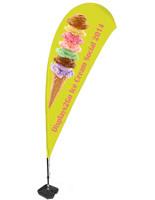 These beach flags provide an easy to see advertisement for use during nearly any event. 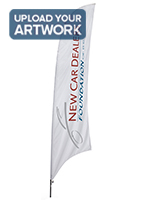 Each unit comes equipped with a teardrop-shaped banner, which is custom printed using your supplied artwork. This graphic is digitally printed using CMYK colors, and is ideal for complex designs featuring photographs and gradients. Advertising banners, custom signs, and other beach flags that are digitally printed do not have a minimum order requirement like those that are printed using a silkscreen process. This graphic does not have as high of a color penetration as the silkscreened ones, meaning the back of the display will not have an easily visible reverse image. The beach flags are held upright by the included ground spike which is for outdoor use only. The ground spike is compact and easy to transport. The beach flags can be used outdoors, but with limitations. This banner stand can be used to promote ongoing sales at a retail store, as well as promoting outdoor events and happenings, such as at a tradeshow or convention. These beach flags often feature company names and inspiring messages, and are used during sporting events, such as marathons for a cause. These printed banners can also be used outside of a restaurant with mouth-watering graphics to draw patrons into your establishment.